Students at Southwestern University are already accustomed to the Pirate Bike, a free, campus-run bike share program kicked off in the fall of 2004. Now, fourteen years later, students momentarily experienced another environmentally friendly transportation option: electric scooters. 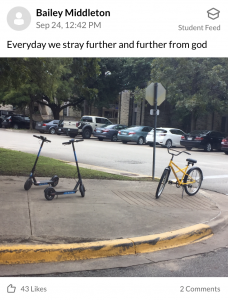 With the growing number of scooters on college campuses across the country, it was only a matter of time until they found their way to Georgetown. During those three hours of operation, a little more than 100 students signed into the app and used the service. Blue Duck is the first scooter company to see Southwestern as an opportunity to expand its domain. It should be noted that this is not the same company as those that have come under fire from North Carolina to Santa Monica, where citizens have complained of the safety hazard. 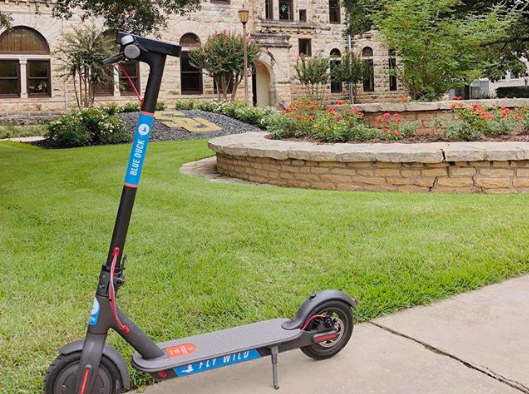 In nearby Austin, the University of Texas has had access to the two scooter companies involved in these cases, Bird and LimeBike, as early as April, according to the Daily Texan, while the University of North Texas has worked to get ahead of the trend, stating plainly that they were not interested in sharing their campus with these companies. According to the Chicago Tribune, “Electric scooter companies [are] able to prove a market existed before they could be shut down, quickly creating loyal customers and amassing valuable transportation data before coming to the table to negotiate with city officials.” This, of course, is not as easy to accomplish on private property like Southwestern. Other scooter companies have a similar defense on this issue. First, they state that it is better to test the community interest before cutting through all the red tape required to establish themselves in the area. Then, after the scooters have been integrated–unlawfully, at this point–they cite the demand for their product as a reason to let them stay. Malik noted the number of scooters they dropped off–around 50, but other publications have reported 75–was dissimilar from the strategies of other scooter companies, who tend to drop off far more, and don’t service the scooters themselves. “We didn’t impound them like they wanted to say. We didn’t impound anything. We just gathered them,” said Chief Dunn. He and the other officers met with the Director of Operations after confiscating the scooters, citing the administration’s issues regarding safety. “Actually,” Malik told me, “scooters move at a slower speed than bikes. We calibrate them with safety in mind.” Founder Eric Bell added that it’s only a matter of time before scooters come to Georgetown and that he intends to work with the city and university officials, as well as residents and other stakeholders, on how best to integrate the service in the Georgetown area. 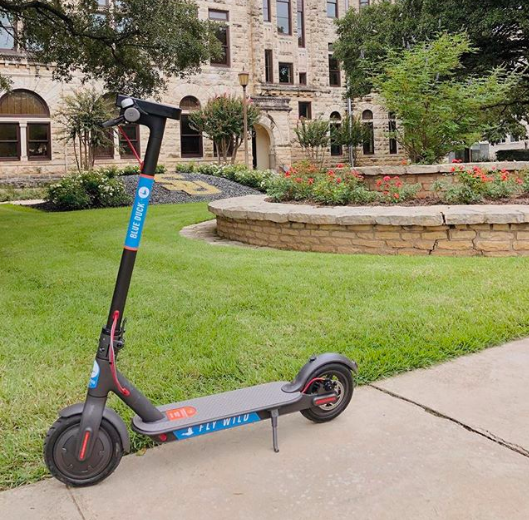 If scooters have a place on Southwestern’s campus, it will be necessary for whatever company willing to fulfill this demand to work in tandem with not only the university but also the city of Georgetown. Providing safer routes for bicycles and alternative forms of transportation has been on the city agenda for more than two years now, and as of now, the city plans to accomplish their goals by 2030. That infrastructure could also accommodate scooters. At this point in time, the electric scooter company is being penalized for a lack of proper infrastructure in Georgetown, as well as the business practices of their peers. Only time will tell if, as Blue Duck founder Eric Bell said, scooters are destined for Georgetown.